We've come a long way from the boom box I used to perch on my shoulder. Ready for a Bit of fun? We've come a long way from the boom box I used to perch on my shoulder. Now there's the Polk BOOM Bit — wearable tech that rocks. 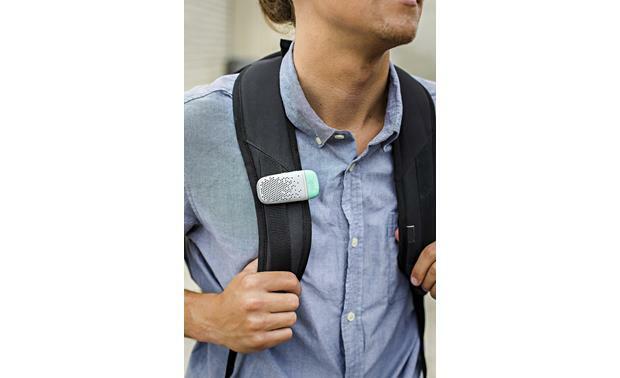 I can simply clip this ultra-compact Bluetooth speaker to my collar, and I'm ready to go. With the BOOM Bit you can run without headphones, remaining safely aware of your surroundings while still enjoying tunes from your smartphone. The BOOM Bit also has a built-in mic for hands-free calling. This is one portable Bluetooth speaker that won't get in the way of your active lifestyle — actually, it just might make it a little more fun. 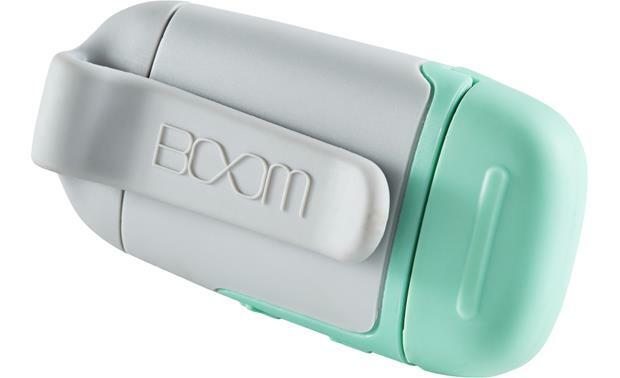 The BOOM Bit's silicone case is both shockproof and dust resistant. So whether you're hiking, skiing, or rock climbing, the BOOM Bit can be right there with you providing the soundtrack. 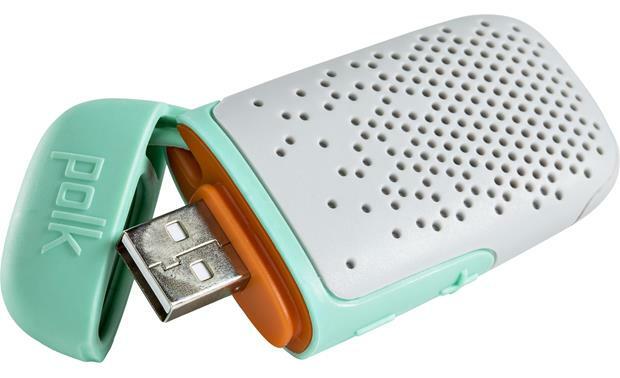 The BOOM Bit's USB port is concealed behind a flip out cover. Simply open it, and insert the BOOM Bit into a USB wall adapter or computer port to charge. You'll enjoy up to three hours of operation from the built-in rechargeable battery — enough for not only a run, but a half marathon. Portable, small, lightweight, and great sounding! Can I use 2 of these paired together for stereo sound? No. The Boom Bit does not offer the ability to be paired with another speaker. 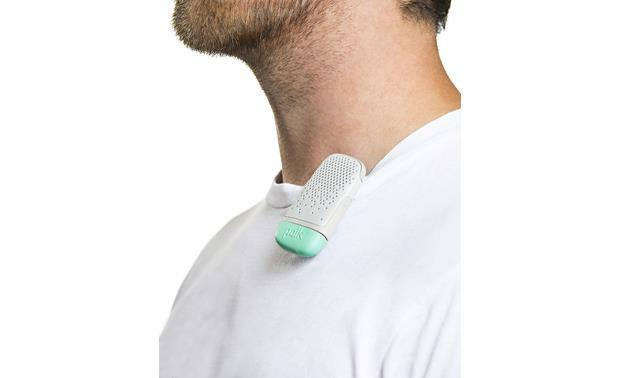 Wearable Bluetooth Speaker: The Polk Boom Bit is a wearable Bluetooth speaker that clips securely to your clothing. 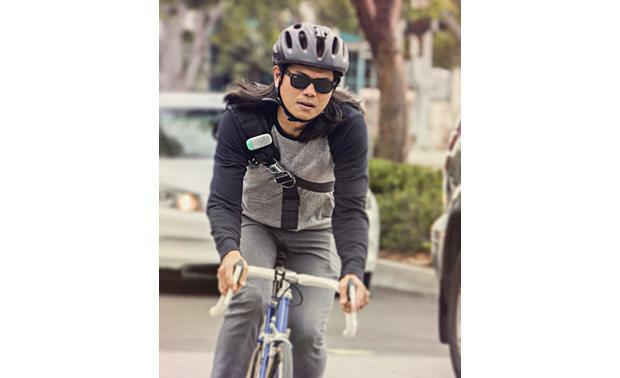 It clips securely to any apparel for a lock-and-stay fit, while you are on the go. Fasten the Boom Bit to your shirt collar for optimal performance. Not recommended for clipping to anything more than .25" thick. Rugged Design: The Polk Boom Bit's textured body and rubberized bumpers are engineered for maximum durability to protect the speaker from bumps and bruises while you are on the move. Monaural Speaker: The Polk Boom Bit features a 1" midrange driver powered by a 1.5W (RMS)/2.0 (Peak) built-in amplifier capable of reproducing frequencies from 220Hz to 20,000Hz. Auto Pairing: The Polk Boom Bit will automatically go into pairing mode as soon as it powers on. You can only pair and connect one device at a time. Wireless Music Streaming: Thanks to Bluetooth A2DP/AVRCP support, you are able to wirelessly stream stored music and music apps from your Bluetooth source device to the Polk Boom Bit. You also get Play/Pause, Volume Up/Down and Previous/Next Track controls on the Bluetooth speaker. If the Bit is paired to your phone and there's an incoming call, your music will pause and your ringer will sound through the Bit. 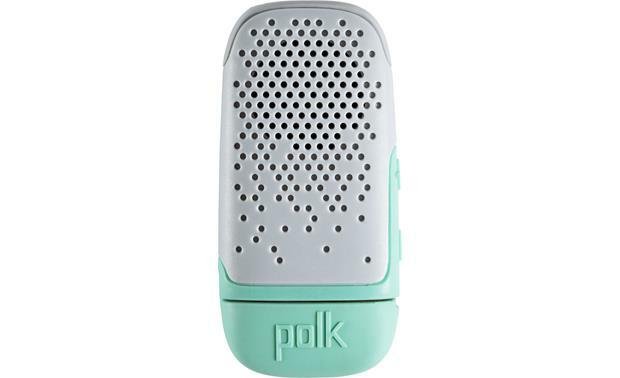 Built-in Speakerphone: The Polk Boom Bit features a built-in microphone and supports Bluetooth HFP, so you can take hands-free calls and talk safely from the Bluetooth speaker. You are able to answer and end calls from your smartphone through the Boom Bit. Use the Bluetooth speaker's built-in microphone to carry on your side of the conversation, while the other party is heard through the Boom Bit. You will still use your smartphone to make a call. Once the phone number is dialed, the call will automatically be transferred to the Polk Boom Bit. 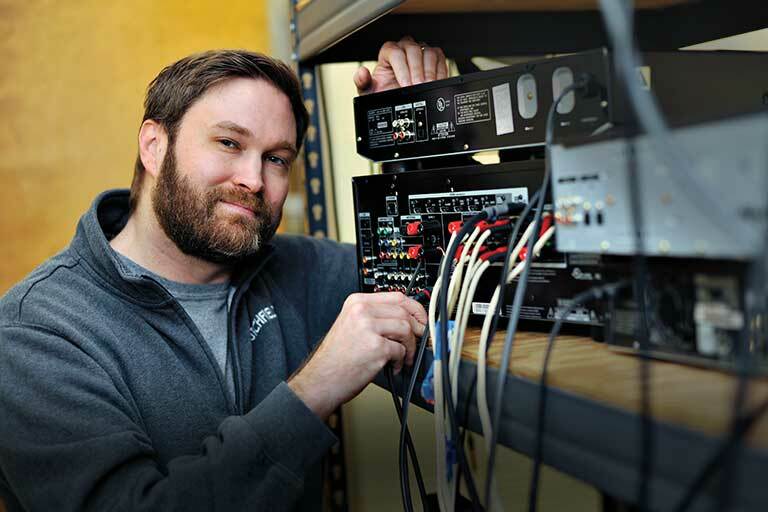 Rechargeable Battery: The Polk Boom Bit is powered by a built-in, rechargeable lithium battery. At full charge the Bit gives you three hours of playback at just over half volume (the preferred listening level based on its proximity to your ear). The Bit will automatically turn off after eight minutes if no Bluetooth connection is established between it and your smartphone, tablet, or computer. 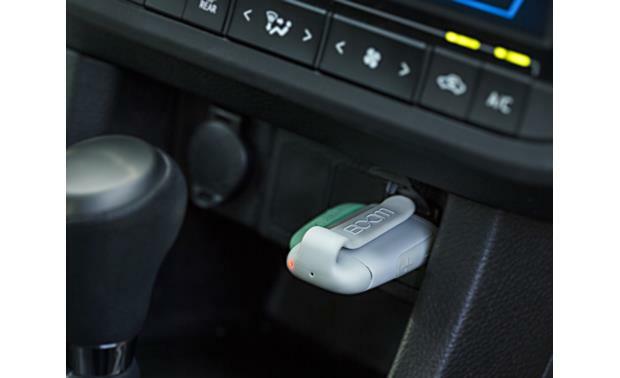 USB Charging Connector: A standard USB-A connector with a hinged waterproof cap is provided for quick and easy on-the-go charging. Just plug the Bit into a free USB port on your laptop or a USB-AC power adapter (sold separately). It takes about two hours to fully charge the battery of the Polk Boom Bit. 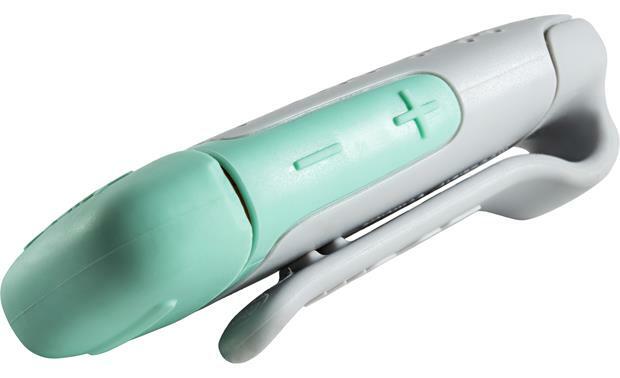 An LED light on the Bit turns red while plugged in and charging; the red light will then turn off when your battery is fully charged. Can this be paired with a TV somehow? Sort of like an assisted listening device?